This is a review of the Viviscal Hair supplement. The supplement that Viviscal provides has a specific formula that claims to promote healthy, natural hair. It also claims to have the added benefit of fighting premature hair loss in both men and women. Continue reading to find out whether or not this product is right for you. When first starting this supplement, most individuals will take 1 tablet, twice a day. This initial regimen should be continued for between 3 and 6 months, at minimum. After this initial period, individuals can continue to take either 1 or 2 tablets daily, as needed for effectiveness. Viviscal’s website suggests using not only their proprietary shampoo & conditioner, but also their volumising hair fibres to maximize success with this product. That being said, nowhere on the website does it specify that the supplement alone will be less effective without these additional products . Viviscal provides a supplement that is 100% drug-free. That means that there aren’t any detected or known side effects. Because the main ingredient (AminoMar C™) is composed primarily of fish protein, those with fish allergies, as well as those who avoid animal products may want to steer clear of this supplement. This product isn’t recommended for anyone under 18 years of age, or individuals going through chemotherapy. The quantities available for sale on the Viviscal’s site vary between 1, 3, and 6 month supplies. These prices start at $89.95 for 1 month, $199.99 for 3 months, and $398.00 for 6 months. The 6-month supply offers you a discount of $147.00. Their site also offers “Viviscal Elite”, which is a subscription program that provides you with supplements every 3 months, as well as several free gifts (totalling $40 in value). This subscription can be cancelled at any time, without penalty. Viviscal offers a 90-day, money-back guarantee. It should be noted that, after an exhaustive search, no customer feedback could be found that specifically referenced the guarantee. However, an overwhelming amount of this reviews reflect positively on both the customer service and quality of product provided by Viviscal. These reviews were found both on Viviscal’s site, as well as many other secondary sales sites. 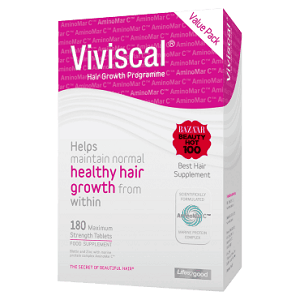 Viviscal’s Hair Growth supplement seems to be a dependable product for those experiencing hair loss. A large percentage of customer reviews about this product are quite positive, with several individuals claiming to have success with this supplement. The product also contains enough of the main ingredient to be effective. That being said, there are inconsistencies that one must consider. For instance, there exists only one reliable, peer-reviewed scientific study done on AminoMar C™ done in 1992. And while that single study saw a 38% increase in hair growth, there aren’t any additional scientific resources available to further support these preliminary findings. Also, as this product contains animal products, it may be unsuitable for those with dietary constraints, like those who practice veganism or vegetarianism, as well as those individuals who abstain from animal products for religious reasons. John Brownstone	reviewed Viviscal	on June 19th	 and gave it a rating of 4.